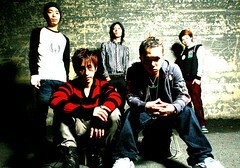 BACK-ON is… Back-On=In Japanese kanji “Sound Explosion” 2002 Teeda, Kenji03, Shu, Gori. The four misfits all from Adachi Tokyo. Plus Kenji03’s big brother’s friend Macchin joins. Teeda & Kenji03, the 2top brings a strong message and the street flavor of Adachi. With trust and respect twards each other, Back-On will always bring “Sound Explosion” for the people. 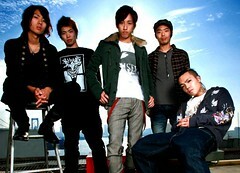 2006-Opening Song of Animation “Air Gear” First single “Chain” makes a smash hit. The mini album “New World” Not only gets big in Japan, even the world starts wanting Back-On. Cutting Edge is actually a sub-label of Avex Trax, a famous Japanese music record company. According to Wikipedia, the Cutting Edge sub-label is known for its rock artists. Their profile has received over 24000 page views – a seriously good sign as according to Volcomtoast/Finger Are I?‘s blog (http://blog.myspace.com/volcomtoast), back in June 2006, they only had just under 400 views! This means an average of 3300 visitors each month since then! The band hasn’t uploaded any videos, but you can still watch the Youtube.com versions of New World (PV), New World (CM), Baby Rock (CM), Chain (PV), Gaku-Ten (PV) and Flydom (PV) – the latter two are both singles from Baby Rock, Back-on’s third album, released in 2005. 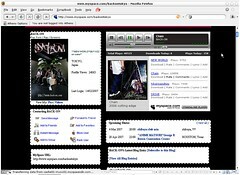 The Myspace page also links to the band profile on Purevolume.com, which says that it is “the place for rising artists to host their mp3s and get exposure“. You can, again, listen to Chain, Drive and New World, but in addition, you can also listen to/preview Kodou or 鼓動, a track featured on their single release ‘Chain‘ in 2006 (Track #3) – a great tune starting off with some fast guitar strumming and drums (ala. the chorus) interspersed with with more chilled-out reggae for the main verse. Back-on have classified themselves under “Rock/Rap/Pop Punk” on Purevolume, but add that they are also “Loud” and are a “J-Rock Band“. Aside from the usual blurb about the ‘New World’ album, they have also posted their support for street-wear brand names found in Japan, such as Tribal, Independent Truck Co. and Globe. 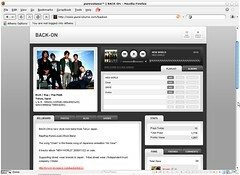 Update [May 18th 2007] : Updated link to new Backonjapan Myspace profile.